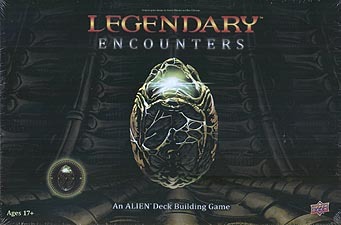 Legendary Encounters: An ALIEN Deck Building Game is a cooperative game set in the ALIEN universe. Players will take on the roles of a Commander, Gunner, Synthetic or any of the ten role cards while recruiting powerful allies such as Ripley, Corporal Dwayne Hicks or Christie the Mercenary. Legendary Encounters will take players on a terrifying journey through all four Feature Films: ALIEN, ALIENS, ALIEN 3 and ALIEN Resurrection as they work together to complete challenging mission objectives. Scan Rooms, Attack Xenomorphs, avoid Facehuggers, and try, TRY to avoid the ultimate death... becoming a ravenous Chestbuster. If a player's fate is destined to this horrific demise, then that player will take on the role of a Xenomorph and try to stop the other players from completing their mission objectives. Work Together or Die Trying... Welcome to Legendary encounters: An ALIEN Deck Building Game.